step 1: Buy two Cassava roots in your local store. step 2: make sure to peel and wash them good before use. 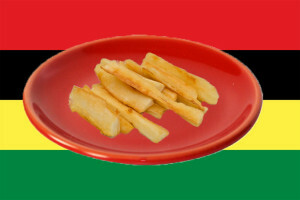 step 3: Cut the cassava roots in half and cut long thick sticks out of them in the shape of thick french fries. step 4: Now brush the sticks with peanut oil or any other oil and sprinkle with a bit of salt and peper. step 5: heat up some peanut oil in a big pan and fry the cassave sticks until they are soft and colorful. step 6: now they are ready to be served as quick fastfood or as a side dish to any of the african food mentioned on this website. Poulet Yassa, french for Chicken Yassa is one of the delicious Senegalese dishes which originaly came from the Casmance region. Chicken Yassa is now eaten in the whole region of West Africa and is becoming also more and more popular outside the continent. 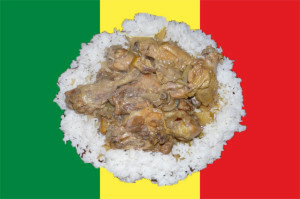 The chicken marinated with a sauce made of mostly onions and mustard has a unique taste and gives the Poulet Yassa the delicious fusion flavors of Senegal. Chicken Yassa is either served with Rice or Sweet Potato. The following recipe is for around 4 to 6 people. Put 2 tablespoons of peanut oil in a large pan and heat it up. Now fry the chicken on high heat so it will turn brown quickly. Once fried turn the fire on low heat and add the onions and the rest of the marinade and cook for around 10 min. Once the onions are soft you should add the chicken stock cubes and 2 cups of waters and soften, add the chicken pieces, stock cubes, 2 cups of water and the dried chili. Now cook for around 45 minutes while stirring occasionally. Taste with a spoon to see if extra salt or pepper is needed. You can serve the rice with either cooked white rice (most common) or Sweet Potato. 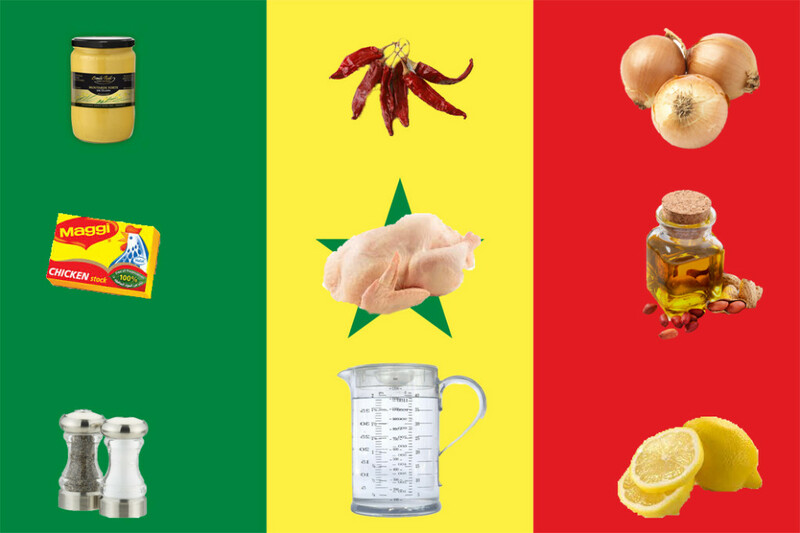 Enjoy the delicious taste of your homemade Poulet Yassa from Senegal. Thieboudienne or Ceebu jën, which means rice and fish in Wolof, is the most famous dish of Senegal and can be considered its national dish. Its main ingredients are rice, fish and tomato sauce. Thieboudienne can alsobe found in neighboring countries such as Mauritania and Gambia. The origin of this dish is commonly attributed to the city of St. Louis, where in the nineteenth century a variant called Thieboudiene Penda Mbaye was prepared. The rice is called “riz graz” in Cote d’ Ivoire , Guinea and other countries of French West Africa but is also similar to the Jollof Rice of Nigeria and Ghana.The realization of the recipe Thieboudienne will take time but it is worth it because the result is too delicious. How to make Thieboudienne recipe? 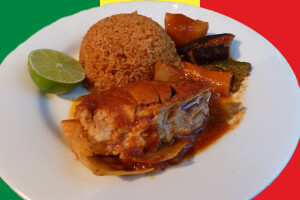 The following recipe for Thieboudienne is meant for 4 persons. Adapt the ingredients to the number of people. Mix the parsley, half the garlic , a little pepper , add salt and half a Maggi . Directory you can loot in a mortar or use a food processor. Then put the mixture into the fish pieces . Step 2: Make the tomato sauce . Heat oil , add onions , tomatoes, tomato paste , the remaining black pepper garlic. Then fry for 15 minutes over medium heat. Then add the fish in tomato sauce. Add the bouillon cube (or Maggi ), with bay leaves and 1 cup of water. Then simmer until the fish pieces are cooked through, about 15 minutes. Remove the fish pieces and add all the vegetables except okra with 1 cup of water and cook the vegetables until they are cooked ( 25-30 min) . You must ensure that the vegetables are ready before removing them, but make sure not to overcook. Then remove the vegetables and add the okra with water. After 5 min remove the okra and add the rice. Cook the rice over low heat , turning often so that all sides are cooked well . When the rice is cooked well its ready for serving. place the rice in a nice dish and arrange the vegetables and fish on top. 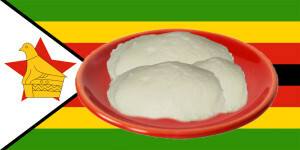 Sadza is the shona word to describe a thickened porridge prepared from any grain and therefore similar to the Ugali of Eastern Africa and Fufu of West Africa. The most commonly used ingredient for sadza is white maize meal, but if not available you can also use any other farina or corn meal. However most Ethnic food stores (African, Asian or Caribbean) will sell white maize Mealie-Meal. Sadza is a stapplefood in Zimbabwe and can be accompanied with both meat stews or just vegetables. The Shona people of Zimbabwe traditionaly do not eat meat daily and therefore the accompanying of Sadza with a meat stew is considered a real treat. Tradtional families might just serve sadza with one of the local vegetables. If you happen to visit a zimbabwean family and you will get served a delicious meal including meat you should consider yourself luckely since this is a sign of respect and importance of the guest. Because of the wide use of Sadza in most zimbabwean dishes, the word is even used to describe the meal itself and in combination with other Shona words it can mean either Lunch or dinner. The best way to enjoy Sadza is visiting a traditional zimbabwean family. However it’s also nice to try to cook this African dish yourself. Traditionally, sadza is cooked in a clay or cast iron pot on an open fire, but its also easy to make in your own house on a normal stove. Follow the easy instructions in this recipe carefully to make this delicious zimbabwean staple food and check out other recipes for zimbabwean stews to serve with Sadza. This recipe is for Sadza as a side dish for about five people. If you have less or more eaters adjust the quantities below to your own calculations, however you can never have more then enough Sadza. First Step: Boil 1 gallon (4 liters) of water. Second step: put five cups of white maize meal in a sauce pan and add cold water to soak the meal. Third step: After the white maize meal is completely soaked one should add a little more water to stir the mixture with a thick stick (or a big wooden spoon). Fourth step: Put the fire of the sauce pan on medium heat and while stirring the mixture add the boiling water slowely and keep stirring in a constant way. Make sure the mixture doesn’t stick to the pan. sixth step: Now let it boil for 5 minutes and add more maize meal flower. Sadza is finger food. However the first time around you may wish to use a spoon until you have had a chance to observe an experienced person eat with their hands – it is quite and art! Wash your hand well in a bowl of clean water. Using your right hand (Shona: rudyi -lit. ‘the one used to eat’) partition a small chunk of sadza and mold it into a little round or oval ball of sadza called “musuwa we sadza” in your palm. Be careful not to burn yourself. Dip (Sh: tonha) it in the soup (Sh: muto) and bite off and eat a sizable chunk. Re-mold the remainder of your sadza in your palm and continue the process. Use your fingers to pick up and eat chunks of chicken or beef. Enjoy! Sadza is normally shared by several people all eating from the same plate and bowl sitting in a circle on the floor. This environment provides amble opportunity to learn sharing as one has to pace themselves accordingly while eating with others. It is particularly interesting to watch children of different ages eat from the same servings. The older children, who may be capable of eating very quickly and consume most of food at the expense of younger slower kids. They will either pace themselves at the rate of younger children or consume a fair portion but leave enough food for the younger children to finish at their own pace – a tremendous way to instill sharing and responsibility. 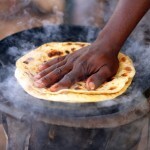 Chapati is an original indian stapple food which is also really popular in east-africa (Kenya, Tanzania etc.) and is part of many african dishes. Many kenyan or other african stews can be eaten with this delicious flatbread. If the dough is too wet or too dry, add a bit more water or flour as needed. Divide the dough into 10 equal balls. Lay the rolled sheet on the griddle or pan and cook for about 30-60 seconds or until the surface is bubbling. Turn it over with tongs and cook the other side for 30 seconds or until brown spots appear. Asaro is one of the most delicous foods coming from Nigeria. Although it’s mostly known as a porridge (there for the english name Yam porridge) one could compare it more to mashed potatoes, but then of course it are mashed yams. Instead of just serving plane mashed yam the nigerians add all these delicious species and ingredients to come up with this delicious dish which originally comes from the Yoruba people of Nigeria, but is now eaten all over the country and beyond. 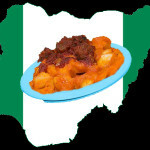 How to cook Asaro Yam from Nigeria? Mopane worms, also know madora or amacimbi is an african food from zimbabwe. although it doesn’t look that tasty it’s really nice zimbabwean dish! 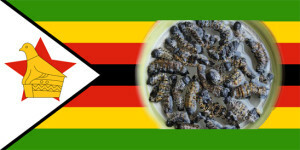 Soak the mopane worms in boiling water for 2 hours or in cold water overnight.